commented on "Rose Daybed. You have the idea! We bring it to life! Made in Melbourne by JARO." 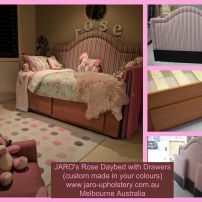 Rose Daybed. You have the idea! We bring it to life! Made in Melbourne by JARO. Our lovely customer wanted a bed to go along a wall in a small space. She didn't want to cover the window or have the bed jutting out in the middle of a small room making it difficult to get around. So together we created this...... CLICK on picture!